Shoorjit Sircar’s Piku has a lot of things to say, and all of them are surprisingly well woven into a two hour long nerd comedy about Motions. Piku’s characters are 'motion' nerds. They are obsessed about Motions. They literally know everything about them. From awkward squatting techniques to chewing food like a cow, you name it, and like every other nerd, they have nothing else to talk about. Every discussion they have, somehow connects to their subject of interest. This uncanny obsession about Motions is perhaps, the movie’s driving force. It’s what induces laughs from the unlikeliest of places, and eases an otherwise tightly packed screenplay about Family values, women liberation and sticking to the roots. Shot partly as a road trip, Piku is a story about how Piku, the movie’s central character, decides to fulfil her father’s curious wish to travel to Kolkata by car, because, well, he neither likes Air Travel or Trains, or their effect on his motions (You might have guessed that by now!). The local taxi drivers shudder at the thought of travelling fifteen hundred kilometres with the Banerjees, who are perhaps the hardest people in town to get along with. In the end, it’s the owner Rana (Irrfan Khan) who must drive them to Kolkata. The ride is a predictably bumpy one for Rana, who finds hard to comply with the absurd demands of his client. Woven smartly into their banter are the movie’s many messages and never feel preachy. One of the reason why Piku works, is the near perfect work done by its crew. Particularly well done is Anupam Roy’s music and Kamaljeet Negi’s cinematography. Juhi Chaturvedi’s screenplay is well done for most of the part. Needless to say, the actors too are in prime form. With Deepika Padukone, Irrfan Khan and Amitabh Bachchan, Sircar, probably gets the best actors he could as for. Though, Amitabh Bachchan as the cantankerous Bhaskor Banerjee pretty much outshines everyone. Amongst the supporting actors, Raghubhir Yadav as Dr. Chaturvedi, stands out. 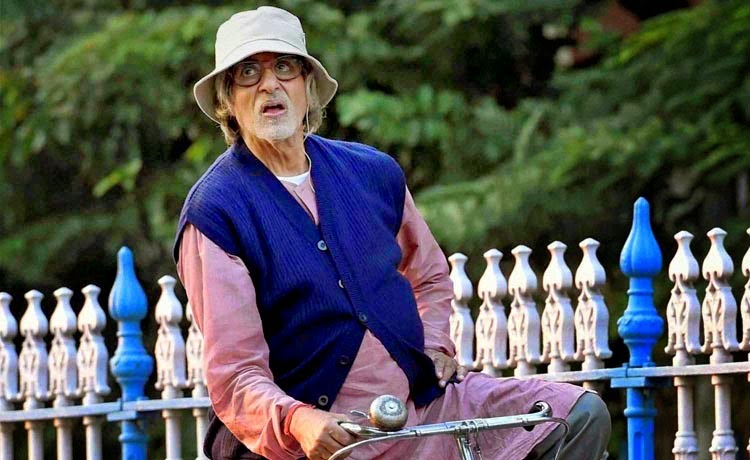 The friendly chatter between Yadav and Bachchan make some of the funniest parts of Piku’s first half. But, perhaps one of the downsides of making a ‘nearly’ perfect movie is that the minor hiccups in the screenplay are largely noticeable (A problem evident with the likes of Haider and Lootera), The climax involving Bachchan riding a bicycle on the streets of Kolkata, is overstretched, and A subplot or two go awry sometimes, not making much sense in the bigger picture. The subplot involving Bhaskor’s abandoning of his ancestral house in Kolkata could have been clipped out, and so could, much of the pointless banter that takes place in Kolkata in the later half of the movie. However these are only minor bumps in an otherwise likeable story. Sircar’s best work yet, Piku is an enjoyable nerd comedy. Few Hindi movies have the power to deliver genuine laughs with subtlety, Piku is one of them.